Gee, I knew it had been a while since I’d updated CGF Blog. But not since October? Oops! Let’s recap in reverse chronological order shall we? a morning finding places to put the zucchini and pumpkins (me), and turning compost and clearing out the chicken shed (R). 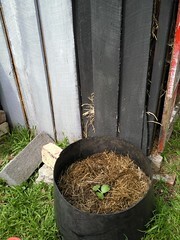 As part of the pumpkin quest I put two more out over the back fence, gave them heaps of compost and watered them in well. Not sure how appropriate it is given that it’s a nature strip zone, but we now have a sprinkler permanently set up over the fence in the hope of increasing the harvest by making it easier to water. 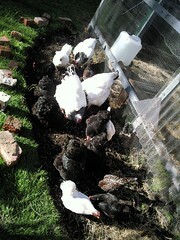 The chickens did the hard work of spreading this batch of compost around the blackcurrants and blueberries. Rain stopped play shortly after lunch until I realised a couple of days of rain and showers was perfect for planting carrot seed as it needs to be kept moist to ensure germination. So on with a coat and hat and out in the rain to plant seeds. 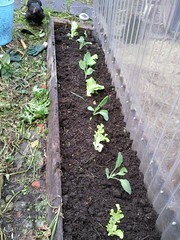 Interplanted with rocket seed as a quick germinator and easy salad greens before the carrots get too big to need the space. 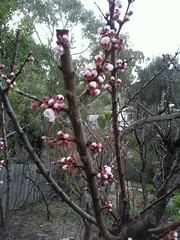 What’s in the garden at the moment? 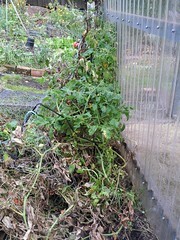 Tomato plants are doing well – nice sturdy plants and gaining height. 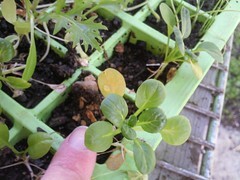 Some small green ones on the plants. 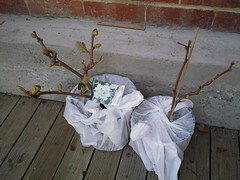 More to be planted out. 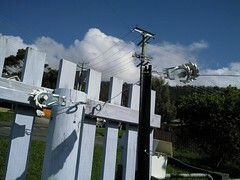 Especially on the side fence behind the chook shed. 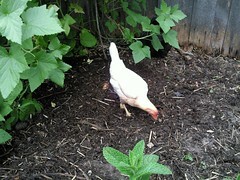 I *did* plant some there and have had to replace several already as the chickens dug them up. And my best anti-chicken measure? Which also does double duty as a heat bank? 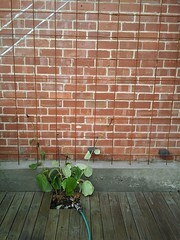 Two bricks, one either side of the stem with a gap just large enough for the stem. Even the big chickens can’t move the bricks! 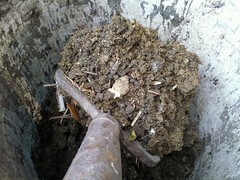 Our horse manure mountain has proved a wonderful resource. 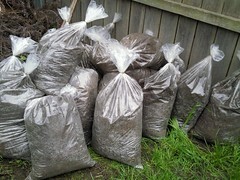 Bags are emptied into the compost and spread on garden beds. The semi circular bed in front of the chook shed has been doing well for a first year bed. The plants are all thriving, but I do notice the difference between the section that has roof overhang – quite a bit drier, so that needs a bit of extra care. Back in late October we harvested the first of the pink eye potatoes from the Poly Bed – the carpet underlay and chook shed litter has rotted down beautifully to make a rich compost. 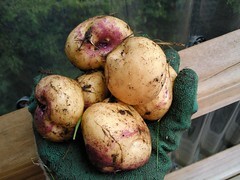 The potatoes are buttery and luscious.It will be fabulous to plant into for autumn/ winter crops. 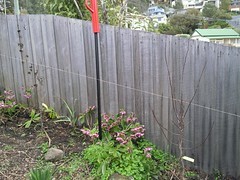 The kiwi fruit vine now has a steel reinforcing mesh trellis. 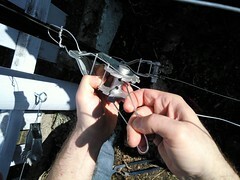 The mesh is set out from the wall so the plant won’t cook in the heat of summer sun. 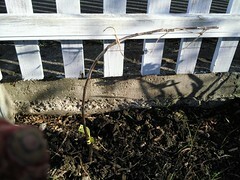 We finished putting it up last weekend and the vine is already twirling around the mesh, growing visibly each day. Two weekends ago I mulched the fruit trees we’ve planted on the back nature strip and felt kind of shifty while doing it. 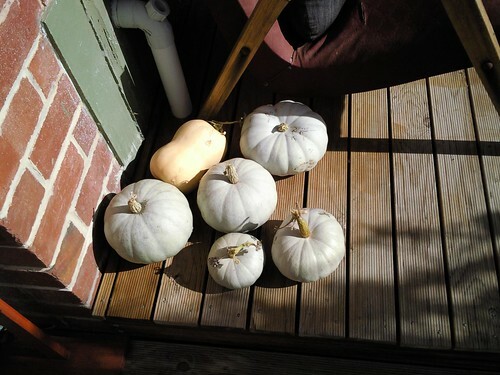 Last summer we planted a couple of pumpkins on the fence line and that didn’t feel too much like we were infringing on shared space. I figure we’ve stretched out the space we are responsible for, and I’m keeping an eye on when it needs whippersnippering a bit more carefully than I used to. And if people eat a couple of apricots, well and good. Ages ago I spoke with the local council and they said as long as we didn’t put a new driveway across or block the view for traffic we were OK to use the space. Earlier in this year I dug through the council planning regulations and could not find any restrictions about planting – although I did find rules and regulations about not being allowed to remove trees from the nature strip. For about 2 -3 months we’ve had a pile of carpet underlay out there covered by a tarp too. And no-one’s complained about that either. Maybe they’re worried about upsetting the crazy people?! When I walked home from work on a Thursday I noticed the same-same nature of the front gardens through Newtown/Mt Stuart. Some lawn, a feature tree or two, some with flowerbeds. I reflected that our front yard takes a similar amount of space, and will give us some tasty fruit too. Once the espaliered trees grow more, they will become more decorative. 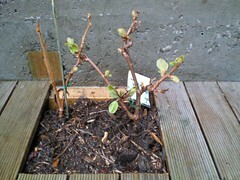 At the moment they are short twigs with sparse leaves. 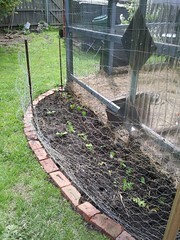 Progressively I’ve spread a bit more mulch out there and planted more strawberries. So our front yard is still quite ‘decorative’ but also hopefully productive. 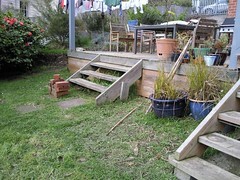 I was nearly out of suburban Mt Stuart when I finally spotted a edible front yard – in amongst more traditional garden beds were two raised vegie garden beds, one full of garlic – cooks in that house for sure! 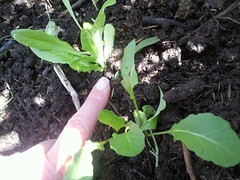 The following week, I spotted another front yard vegie planting – broccoli that time. The side path linking the front to the back now has a better turkey barricade – while I was inside one day, they’d dug about 10 of the strawberry plants up – some were even tossed down onto the path. Many rude words later, the barricade is better, and the strawberries replanted. Last weekend I drove around the corner into a neighbouring street and saw a skip full of bricks and other building detritus. Happy! We’d been dropping into the tip shop on a semi regular basis looking for bricks to continue our garden bed edging and not having any joy. 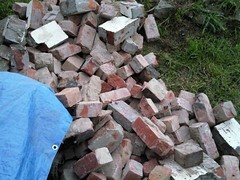 As we were loading the trailer for the second time with an assortment of half and three-quarter bricks (very sensibly, the people who had been demolishing the walls had kept the good whole bricks to themselves) another neighbor wandered across the road enquiring if we wanted to buy some good, cleaned bricks. You betcha! Another trailer load of bricks. And some sheets of concrete reinforcing mesh to make trellis for the kiwi fruit. We’d been thinking we’d need to go look at mesh and then arrange it to be delivered. Instead, we picked it up and walked it home! 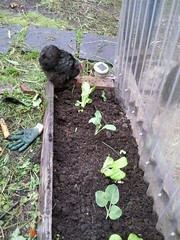 Last weekend I also planted out carrot, radish and beetroot seeds. 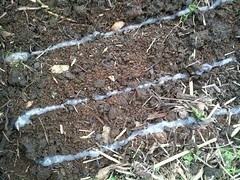 After a very wet Friday, the soil was ready on Saturday. I used the cornflour slurry that Steve Solomon recommends to spread the seed a bit thinner, and keep it damp to support germination. 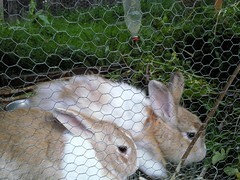 I also used some of the Renew fertiliser I picked up at the Farm Gate Market. It is made from wood pulp waste and poppy waste and composted. A local product that uses waste to create something valuable. The texture is great – light and spongy when wet and holds moisture well. On the to-do list is to go buy a trailer load. This weekend started with a soil blocking ‘workshop’ with Mum – to see if the soil blockers were comfortable for her to use (I didn’t want to be responsible for damaging a weaver’s hands), and to start her off without having to make a huge batch of the mix. Apparently they travelled well and made it home to their place in one piece. 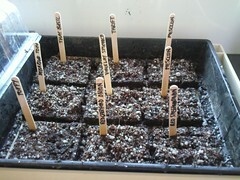 I continued on the theme with planting lots of seeds, and ‘potting on’ some of the tiny soil blocks into the larger ones. So easy to just pick up a little cube and drop it into the larger block. Also using a standard sized tray, it is possible to fit 180 tiny cubes! I’ve got quicker at picking up individual seeds and placing them in the little indentations too, meaning only one seed per block. Less work down the track, for only a little more care at the beginning seems like a good deal to me. Despite adding some more shelf space in the greenhouse, i’m getting tight for space. So some seedlings, the sturdy cucumbers, beans and zucchinis etc as well as some delicate tomatoes have gone into some plastic storage tubs aka cold frames on top of the chickens’ sleeping area. 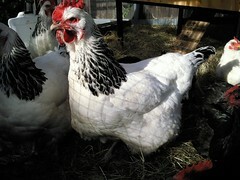 The idea being during the day the sun will warm them up, and at night the chickens will provide some background heat from underneath. Robin started the new garden bed outside the chicken house. When we built the new shed we were concerned it might get rather hot in summer as it gets full sun through the day, much more than their old shed did and we don’t want roasted chook. So the roof trusses were extended over about 60 centimetres so we could attach trellis and grew climbing beans up to make a shade front wall for the chooks. 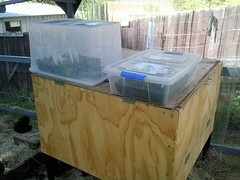 And get more vertical growing space too. Today, Robin started by removing the clover we’d planted, and any grass, and moved it into the chook shed for them to pick over and scratch. To get them scratching the exposed earth in the new bed I scattered some seed, and suddenly the soil was covered with the girls. With some more encouragement (seeds) in the evenings the girls should have the area prepped for planting by next weekend. Trying the space for size. Deciding how many boards I would need to cut. You need both a female and male plant if you want kiwifruit. 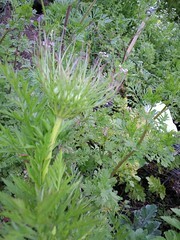 The male plant is the larger one as it was a year older. This was the treasure I got with a Stoneman’s voucher I’d received as a goodbye. So I better not kill them! Dug out about 100 litres (measured in 20L buckets) of icky sticky yellow clay by lying on the deck digging blindly with a trowel after loosening what I could with a fork. 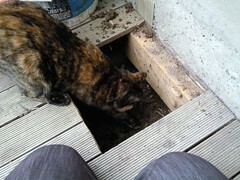 I dropped the soil level directly under the hole by about 20 cms giving a 40′ish cm height to the planting area. The rest of the hole was more like a flattish bowl. Deep enough to lie on the deck and put my head down the hole at any rate. 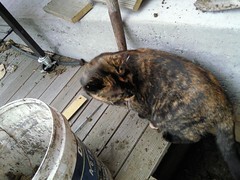 Milly checked under the deck and came out with spiderwebs on her. I filled a rough circle about 3 feet in diameter under the deck with the contents of 2 compost bins, a bag of potting mix, some gypsum (clay treatment) and perlite (was hanging around from another project). 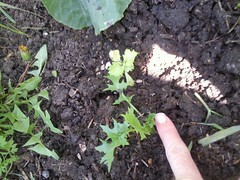 As the soil settles a bit I will tuck more compost down the sides of the hole. We can water through the deck across the eventual root zone. Happy in their hole after planting. A week later and the leaves are really coming along and I need to investigate reinforcing mesh to attach to the brickwork as trellis. Apparently a good vine can produce up to 80 kilos of fruit. Mum remembers getting 200+ per year from their 2 female + 1 male vine in Melbourne years ago and giving them away to people in egg cartons. Strange furry eggs. 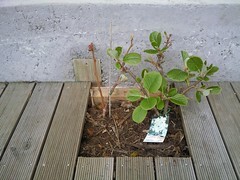 Kiwi fruit after one week in their deck hole. Today really sold me on the soil blocker. I’d spent some lovely time last night playing with my packets of seed. Selecting out which packets would be planted today. 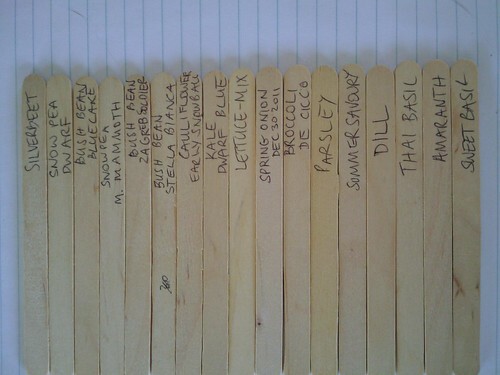 Writing up labels. 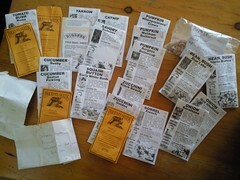 Vowing not to buy any more packets of seed until winter crops need sowing. 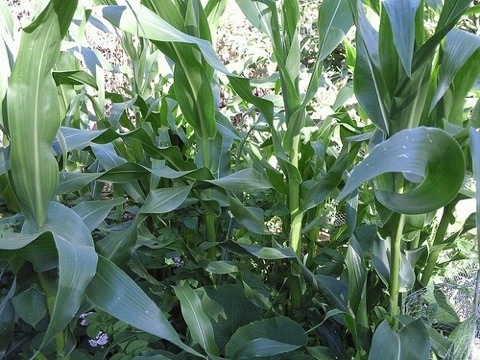 Compare these photos – all were from the previous seed sowing (24th July) and transplant (7th August) occasions. 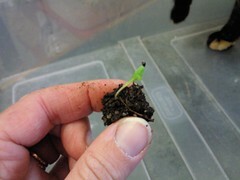 As part of tidying the greenhouse this weekend I wanted to plant some seedlings out and really was surprised by the difference from a single seed planting day. Finger included for scale. 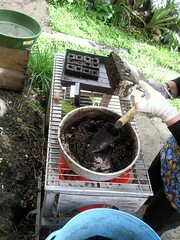 Seeds were planted in clumps, then transplanted off into soil blocks (A). The rocket in the second photo here is from the same batch as photo D, the only difference was the transplant to a soil block. 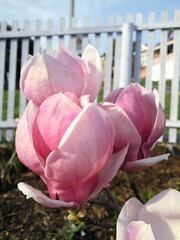 These got planted into the garden yesterday (17th September). Others into the individual cells (B). 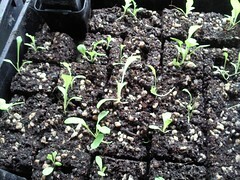 Some were planted direct (and thinly) into the individual cells (C). 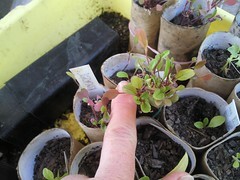 Also are some seedlings planted into toilet paper rolls and not transplanted (D). 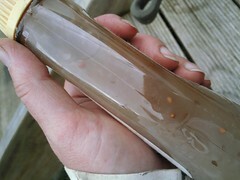 Worm farm is the destination for D.
I couldn’t really believe the difference. All were in the greenhouse and got watered the same. On the same shelf so sunlight wasn’t a factor. Same seed raising mix for all.The individual cells even had a solid tray underneath so theoretically they should have been more consistent in moisture. The toilet paper rolls do dry out more quickly. 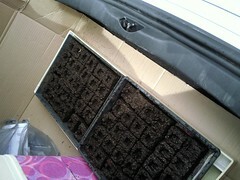 Needless to say all the seeds I sowed today were into soil blocks. And planting out! with the soil blocks you just pick them up, place them in the hole or trench and backfill. 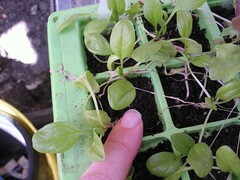 No tapping out of pots, no turning upside down or teasing apart seedlings planted too close. 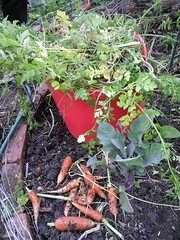 No picking up pots from around the garden after I’ve forgotten to collect them all and they get blown around.